Alibaba's shopping sites account for 80% of online retail in China. Meet four successful merchants. Alibaba, now heading for a splashy New York IPO, dabbles in most things digital but is best known for its shopping sites -- Taobao.com and Tmall.com. They account for nearly 80% of China's online retail sales, receiving more than 100 million visitors a day. Launched in 2003, Taobao -- which means "searching for treasure" -- is similar to eBay or Etsy in allowing individuals to sell directly to consumers. It's stocked with millions of products, everything from mint green high heels to toilet seat stickers and luxury pet beds. On average, 48,000 items are sold per minute on Taobao. Tmall -- with a Chinese name that means "sky cat" -- debuted in 2008, and caters to more than 70,000 domestic and foreign brands looking to tap into the market. Chinese smartphone maker Xiaomi, Apple, Ray-Ban and Nike all have storefronts. The site is even built like a mall, with departments on different "floors" of the website. China is already the second-largest online retail market in the world, and the fastest growing. The industry brought in roughly $210 billion in 2012, and is expected to hit $650 billion by 2020, according to McKinsey. CNNMoney tracked down a few of Alibaba's top merchants. 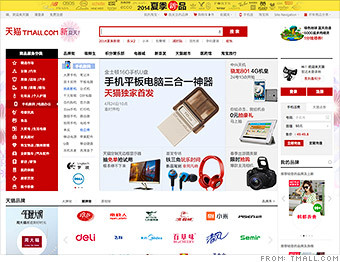 These are the stories of four small business owners making it big on the Chinese web.